During the 2012 election, then-Texas Gov. Rick Perry caused a firestorm among big-government types during the Republican presidential primaries last year when he called Social Security a Ponzi scheme. He was right. It’s been a scam from its inception, and it’s still a scam today. Over time, life expectancy grew and surpassed 65, the so-called trust fund was raided and spent, and the system was paying out more money than it was taking in – just like a Ponzi scheme. FDR called Social Security an insurance policy. In reality, it has become forced savings. However, the custodian of the funds – Congress – has stolen the savings and spent it. And the value of the savings has been diminished by inflation. Last edited by Suzanimal; 04-14-2017 at 06:37 PM. Four million dollars a day for the White House to operate I've come to find out. And what ever happened to Donald Trump's tax plan? Meh. Theft is inevitable with constitutionalism. Filed next to the Wall's blueprints, until the next election. If you don't pay your taxes (debt you DIDN'T agree to) they confiscate your stuff and/or put you in jail. If you don't pay private debt (debt you DID agree to) nothing happens. Why is that? Zippy? Count? 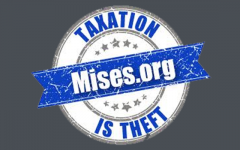 If you don't pay private debt your stuff is confiscated. We have long had death and taxes as the two standards of inevitability. But there are those who believe that death is the preferable of the two. "At least," as one man said, "there's one advantage about death; it doesn't get worse every time Congress meets." Taxes: Of life's two certainties, the only one for which you can get an automatic extension. You're not thrown in a cage at gunpoint. Public debt was never agreed upon, so has no legal or moral standing.